Our names are Justin and Nick. We are the only independent home inspectors in Ohio that have signed the IHINA "NO CONFLICT OF INTEREST PLEDGE". Our commitment is to serving our customers with the utmost integrity. This means we only work for you and no other party with a financial interest in the sale of a home. We are not interested in using your home inspection as an audition to maintain or gain referrals from your realtor. You can be confident that your home inspection report will include 100% of the problems we find. We hope that you, like many others, will see the benefit and value of a independent home inspection. What Our comprehensive home inspection covers? Your inspection includes an electronic report with digital photos, videos, and inspector comments that will be delivered the day after your inspection so that you have plenty of time to review our findings and make important decisions about the property inspected. Our competitors home inspection, $250-350. An independent home inspection by Reveal, priceless. 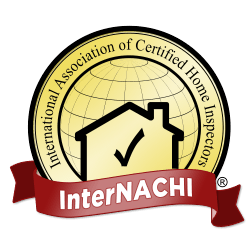 All inspections are performed by NACHI certified professional home inspectors that go above and beyond the InterNACHI Standards of Practice and Code of Ethics.